Patsy Joyce (Arthur) Simac, 77, of Winifred, MT, passed away on March 15, 2019 at the Central Montana Medical Center. Patsy was born to Hedley and Tiny (LaFountain) Arthur on July 3, 1941 and grew up in the Suffolk and Winifred communities. She inherited her love for horses from her dad Hedley. She loved anything to do with the outdoors and would often trade chores with her brother Jim so she could spend more time outside. For her early education, Patsy rode horseback or in a horse drawn buggy to country school with her brothers until they closed. Then they attended the Winifred Public Schools where Patsy took part in sports, tumbling and 4-H. 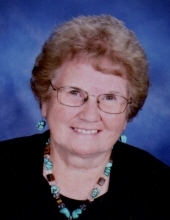 Patsy graduated from Winifred High School in 1959 and went to college in Billings to pursue a degree in Elementary Education. She then taught at Midale country school near Malta. On June 28, 1961, Patsy married Bob Simac at St. Victor’s Catholic Church in Hilger. It was a small and discreet wedding. For the honeymoon, they headed to a rodeo in Canada where Bob was entered in a calf roping event. Bob and Patsy lived in Havre while Bob worked at the stockyards and Patsy continued her education at Northern Montana College. In 1962, they moved back to help Bob’s mother and purchased the neighboring ranch. After almost seven years of marriage, they were blessed to add twins, Kelly and Kerry to their family and their daughter, Jodi six years later. Patsy also became a second mother to their nephew, John Hruska in the fall of 1984 when he came to live with them. Patsy worked at Fred Crow’s garage as a bookkeeper for many years before becoming a full-time ranch wife and mother. She was very active on the ranch and preferred to ride and work with cattle but would help with the farming or anything else that was needed. She was also a member of Altar Society and taught bible school. In her spare time, she loved crafting and traditional Native American beadwork, which she learned with her mother, Tiny. Patsy and Bob moved from the ranch to Winifred in 2007 but continued to be a part of the farming and ranching operation. Once in town, Patsy was happy to be able to have a beautiful yard, and small garden, and most importantly be able to spend even more time with her six grandchildren, who were her greatest blessings. Patsy is survived by her husband, Bob Simac; brothers, Sid and Larry Arthur; sister, Beatrice Lunda; children, Kelly Simac, Kerry Simac, and Jodi DeMars; grandchildren: Samantha, Rebecca, Anthony and Johanna DeMars, and Jacob and Kenadee Simac. She is preceded in death by her parents, and brothers Tony, Jim and Don. Funeral Service will be held at Saint Leo’s Catholic Church on Wednesday, March 20th at 1:00 pm with a private burial at a later date. Memorials may be made to the Winifred Ambulance or to Central Montana Hospice. To send flowers or a remembrance gift to the family of Patsy Joyce Simac, please visit our Tribute Store. "Email Address" would like to share the life celebration of Patsy Joyce Simac. Click on the "link" to go to share a favorite memory or leave a condolence message for the family.